Actress Choi Jung Won is attracting attention after starring in Brain. On December 14th, 2011, Choi Jung Won posted on her me2day with comment, “Written ‘Lee Kang Hoon,’ reading ‘love.’ The brain of Ji Hye falling into love is amazing and beautiful, right? I also know for the first time that human brain, human heart, and so on, are such an amazing things. Everybody be in beautiful romance this winter.” And she attached a photo. 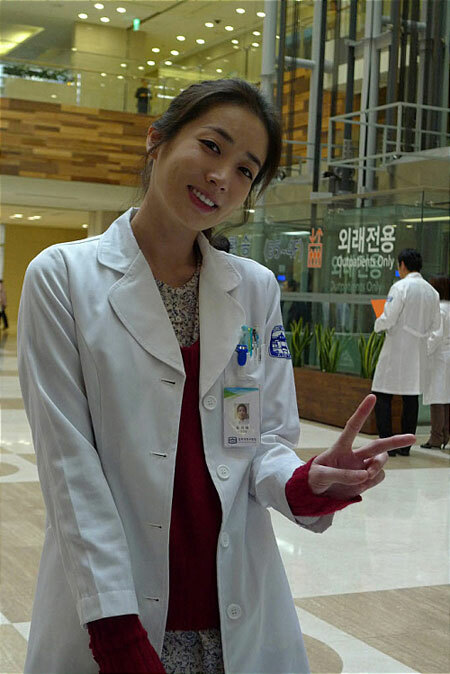 The photo was taken in the hospital where Choi Jung Won was filming Brain, and she was wearing a white robe and showed bright smile. Even during the particularly difficult shooting, Choi Jung Won tries to pass on the news from the set to fans whenever free. The intention to communicate with the fans has received endless praise.